Widely known in his native country of Germany as CASE, Andreas von Chrzanowski is one of four members in the "Maclaim Crew," a group of individuals famously considered "pioneers" in the photorealistic graffiti scene. The group has gone as far as to cover the entire sides of buildings with colossal depictions of everything from everyday portraiture to more odd examples such as this scantily clad woman sporting a pig mask and inelegantly carrying a cat. While many of his works have consisted of the optically bizarre using true-to-life shades and hues, one recent mural conducted for the art collective powwow in Tokyo, Japan hasn't completely deviated from that style. 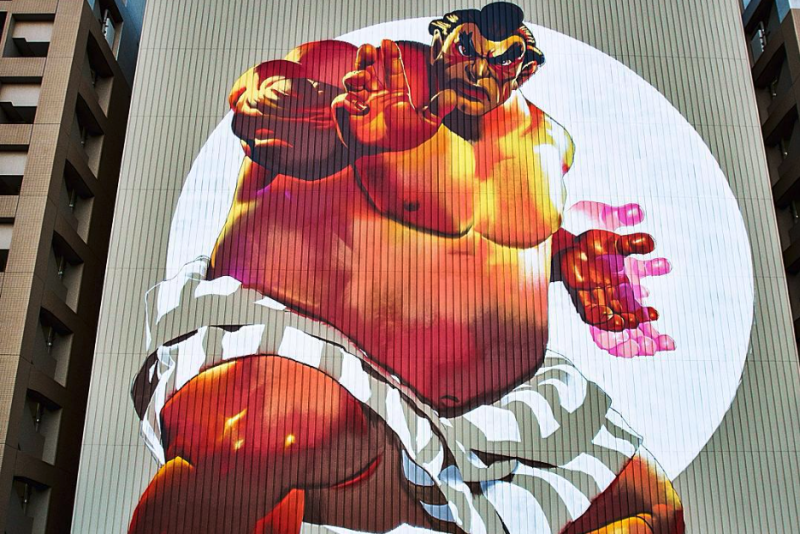 Fittingly, it's a massive, twelve-story painting of E. Honda from Street Fighter. The artwork can be found near the Tennōzu Isle Station in Shinagawa, Tokyo, and it's burdened Instagram with some heavy traffic thanks to its clearcut towering presence. Photos can be seen below, courtesy of Moon83 on Tumblr.